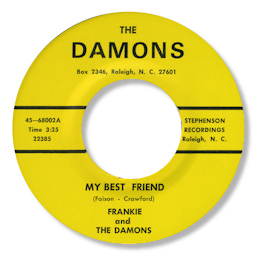 Self contained R & B / soul band Frankie & The Damons came from Raleigh, NC and although the musicians were white they had black vocalists. It is to their credit that they recorded songs that are highly regarded in the Northern soul world (“Man From Soul”) and the funk congregation (“Bad Woman”) – both of which are very hard to find on 45. But the “A” side of the latter My Best Friend is far and away their best effort, but of course this has been overlooked in favour of the dance cuts. After a flourish from the brass, the lead singer comes in hard and strong, with a lovely rasping tone. Great playing from drummer Frankie, guitarist John Wilson and co-writer Chip Crawford on organ. The singer on “Man From Soul” was Howard Exum – could he be the fine voice on this one too? If so he deserves a lot of the credit here. There is a very brief article on the group here. UPDATE ~ Ben Runkle has written to say "It was a treat to find your page on my old band, Frankie & the Damons. I played tenor saxophone in the group and am still occasionally in touch with Frankie Presnell who was the drummer. It was great that you gave credit to Jason Perlmutter who has worked so hard on this stuff; he's a very nice fellow. I share your opinion about our song "My Best Friend". The singer on that record was not Howard Exum, as on "Man From Soul", but Joe Faison, now deceased." It was very kind of Ben to write - I'm grateful to him for the excellent info. Thanks to Jason Perlmutter (see Links) whose knowledge of Carolina soul is unmatched.